Talkeetna is the staging area for over 1,000 climbers who attempt to climb Denali - formerly known as Mount McKinley - each year, but there are ample opportunities to see this mountain without having to climb it. In May and June you can spot mountain climbers milling through the town. Feast on the Alaska-sized breakfast at the local roadhouse - a favorite among returning climbers. Located at the confluence of three major rivers, the town keeps its mining history alive with renovated miners' cabins used as lodging, shops and restaurants. The rivers also lend to a multitude of activities like guided river rafting, boat tours and sport fishing - some of the finest in Alaska. Explore the land on a guided hiking tour or by ATV. The Alaska Railroad provides daily service to Talkeetna in the summer and weekly in winter. Talkeetna's charm is in it's down-home feel. Local artisans sell their wares at an outdoor market in the summer, and art galleries filled with unique Alaska gifts line historic Main Street. Talkeetna is also home to several restaurants, from fine dining to street fare. Live music is a staple of the downtown scene, including weekly concerts every Friday in the town courtyard throughout the summer. Stop in to the local microbrewery for lunch, or spend an afternoon at the Talkeetna Ranger Station - this small town bustles with activity. Talkeetna's "air force" specializes in flightseeing tours to Denali and glacier landings. 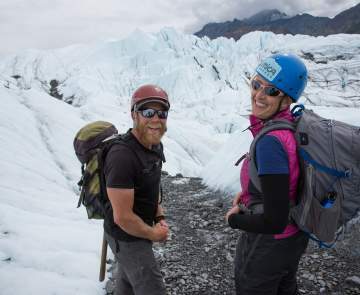 Alaska is one of the few places in the world you can land on a glacier, and our visitors rank the experience as one of their favorites during their Alaska vacation. 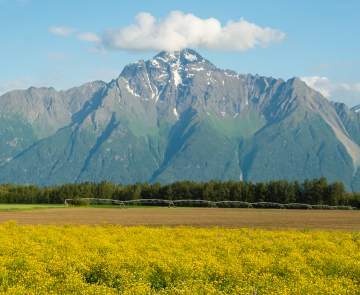 Flightseeing tours depart from the Talkeetna Airport, within walking distance from the downtown area. Jet boat tours are also very popular - you will get a chance to see class V rapids from the safety and comfort of a covered boat. Tours also stop at old miners' and trappers' settlements, where visitors find out how early settlers to the area lived off the land. Talkeetna is also an excellent winter destination, as the restaurants and shops stay open year-round. You can ride the Alaska Railroad to Talkeetna and participate in a hands-on pie making class at the Talkeetna Roadhouse, for example. In December, the town hosts Talkeetna Winterfest, including the world famous Wilderness Woman competition and the always fun and interesting Talkeetna Bachelor Auction. At the Don Sheldon Community Arts Hangar, the town's arts council puts on concerts, revues and drama productions throughout the winter, giving you plenty of options.